Welcome to another edition of THIS THING RULES where I try out some new music software and share my thoughts. This time I’m checking out Applied Acoustics System’s CHROMAPHONE. Chromaphone is a really awesome piece of software that I’ve been playing with for a couple months now. I would have written this post sooner, but I was busy finishing up, releasing, and promoting my album (which you can of course check out on the album page). The track you listened to at the top was created COMPLETELY with sounds from Chromaphone. Yes the drums, the keyboards, the bass, the synths, the pads… All of it. Pretty cool, right? I’m not going to go into my whole process of composing music in these posts (although I may let you in on that in a future blog series). This is more about the specific software and what it’s like using it. Chromaphone is really cool in that you’re essentially starting off with percussion sounds and bending and tweaking them to sound like all different kinds of instruments. Woods, metals and other materials can be adjusted in all kinds of ways for really interesting results. Of course there are tons of presets too. These little reviews aren’t meant to be big, long in depth articles, so I’d like to specifically talk about my favorite feature of Chromaphone… Coupling. What this does is adjust the amount that two objects would interact. In a real life example, imagine your hand and the desk. Some of the sound you hear when you slap the desk is coming from the desk, and some from your hand. Adjusting the coupling not only allows you to choose which you’re hearing more of, but how the one effects the other. You can use this to make instruments sound more realistic… Or more weird and unique. In this specific demo track I created up above, you can hear examples of drums and percussive elements, keyboards, strings, bass and pads, all created with Chromaphone. In fact between the included presets and the awesome expansion packs available you can really have fun without even having to dig into the powerful sound creating abilities of the software. I did plenty of messing around with the sounds though in composing this piece of music and it’s a really cool process. 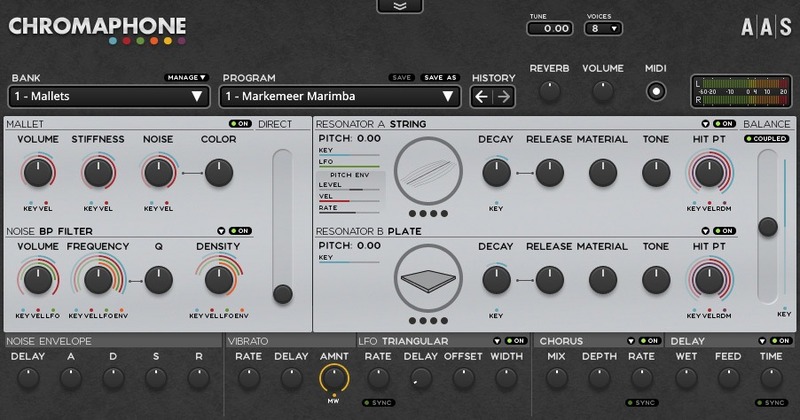 AAS has laid out the VST software in a way that is really smart and easy. As you can see from the above screenshot, there are tons of effects and settings to play with right there on the main screen. And where in some pieces of software, you can sometimes adjust things all over the place and not really notice or understand what you’ve changed, tweaks within Chromaphone are instantly noticeable making for a remarkably hands on feel. If you’re a composer like me, I hope you check out Chromaphone. It’s regularly $199 but they have deals pretty often (until January 15th its $99.50 or half off!). It’s a great piece of software and the possibilities with it are really endless. It definitely digs into your CPU usage, so make sure you’ve got a good, powerful machine if you’re going to give it a try… I had to freeze a couple tracks to stop some crackling that was occurring… but what do you expect with 9 instances of the software going at once. And if you’re not a composer and just enjoy the music, well I hope you enjoyed this track, and I hope you enjoyed reading a little about how it is that I do what I do. All Rights Reserved. © Music by David Rosen. Support Local Music.